Description: His most notable feature was not a physical characteristic but his red ax. It can be assumed he looked much like any other Dwarf. Dain, actually named Dain II Ironfoot, was one of the great Dwarves of his age or perhaps any age and was an important figure in The War of the Ring, although much less heralded in the histories of Elves, Men and Hobbits. The young Dain became the lord of the Dwarves in the Iron Hills in the north regions of Middle-earth, declining to enter Moria after the battle with the Goblins. After burning the great number of dead and leaving no armor or weapons behind for Orc scavengers, Dain, who saw that a Balrog of Morgoth lurked within, led his folk back to the Iron Hills, leaving Thrain and Thorin Oakenshield behind with the head of Azog. The events told in ‘The Hobbit’ concern chiefly Thorin but Dain enters the story when, after receiving a message from a bird, led his folk to again bleed for his people at the Battle of Five Armies to once again fight goblins, including Bolg, the son of Azog. It is likely most of the Dwarf soldiers on the field were grizzled vets of the previous Orc war and would have been experienced survivors and killers. Soon after the battle, his status was elevated to King Under The Mountain, giving Dwarves a mighty presence and fortress as Gandalf desired. The Dwarves and men of Dale were a strong presence that secured the north of Middle-earth, leaving the War of the Ring and Sauron more to the south around Mordor and taking the Great Dragon out of play. It is said that Dain was a “great and wise” leader and though details are scant, it is said that had not Dain and King Brand stood in his path, Sauron may have been able to stretch his arm north and cause great destruction. It was from Dain’s people in the Iron Hills that Balin, without his leader’s willing consent, made the journey to reclaim Moria for the Dwarves. It was to Dain’s door that Sauron sent a horsed messenger that promised to return three of the seven Dwarf rings in exchange for Bilbo Baggins and his ring. The dwarves did not answer but the rider returned, eventually demanding an answer, all of which prompted Dain to send Gloin and his son Gimli to Elrond to warn Bilbo and seek counsel. In 3019 an army of Easterlings attacked the Lonely Mountain and Dale. Dain died at a great age during that attack, part of the War of the Ring, still fighting as a mighty ax-wielder despite his great age. He perished standing over the body of his friend King Brand (grandson of Bard) before the Gate of Erebor. He was one of a very few who battled in both the Battle of Five Armies and took part in The War of The Ring. It seems unlikely that the 252-year-old Dwarf was aware, but only weeks before his own death, the path for Dwarves to return to Khazad-dum was cleared when Gandalf the Grey battled and slew Durin’s Bane, the same Balrog of Morgoth featured in “The Fellowship of the Ring”. 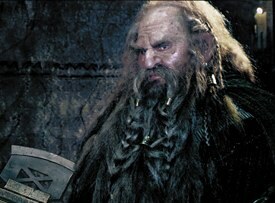 Analysis: It is not known that Dain will be in ‘The Hobbit’ films but the possibilities are rich with emotional content. It seems a likely choice with enough information to provide the screenwriters a genuine character with enough flexibility to enrich the screenplay. Plus, how cool would a famed deadly red ax, one of the premier dwarf weapon in Middle-earth, designed by Weta be? Dain is also an existing and organic thread that can be used to tie “The Hobbit,” and “The Lord of The Rings,” together.